For the past few months, Isaac and I have been trying to figure out where we should go on our Honeymoon in March. Friends, strangers, family members, and coworkers have been urging us to go to Europe, Belize, Costa Rica, Dominican Republic, Jamaica, Grand Cayman, you name it! Alaska and Colorado were even briefly talked about. But then I remembered how cranky I get in freezing cold weather. Thanks, but no thanks. Picking a honeymoon spot should be easy, right? Choose a country, an airline, a hotel, and BAM! Paradise awaits. For most couples? Yes, it is that easy. For Isaac and I, not so much. We can’t leave the country (rather don’t feel comfortable leaving the country) because of my life threatening food allergies. I don’t eat out much due to the severity of them, so eating at a restaurant in a place where the staff may or may not understand English is completely out of the question. People have told me about the allergy flash cards you can bring with you that will translate what your allergies are, but I don’t trust it. I have had servers accidentally serve me egg here in North Carolina, so the risk is just too high in another country. We played around with the idea of going to the South Carolina coast or even Florida, but while I tried to get excited about it, my heart was screaming BOOOOOOO! A Honeymoon is supposed to be exciting, adventurous, romantic, and full of exploration. I don’t want to go somewhere that I could just as easily visit on a long weekend off of work. So now here we are, we have finally picked a Honeymoon destination: Hawaii! It is perfect. It is still part of the United States so food packaging is the same, Isaac can get great seafood and local fare, and the amazing views, mountains, and tropical islands will make it feel like we are in another country. The only downside is the 12-hour flight and the time difference, but that is a small price to pay for the amazing vacation we are sure to have. Now we are searching for the right hotel. We need a room with a kitchen or at the very least a nice sized fridge for me. I will need to hit the grocery store and stock up our room so I can fill my belly before heading to a seafood restaurant with Isaac. 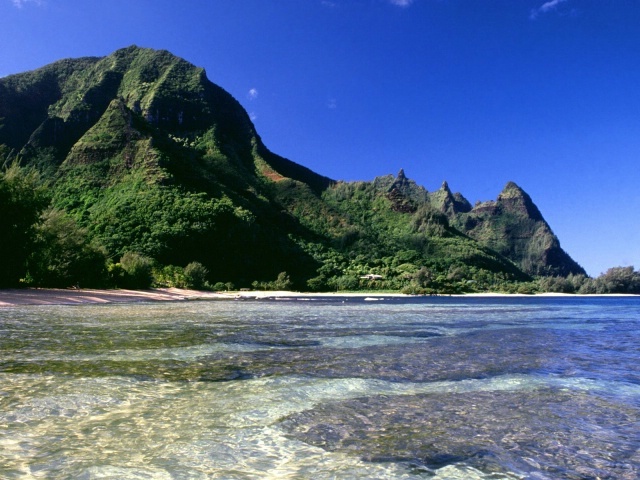 Kauai looks like a great place to stay, as does Maui. It’s funny, before becoming allergic to seafood I never really thought about how difficult leaving the country would be. Now even the thought of going on a cruise gives me chills. When it was just egg I was allergic to, traveling and eating out was a lot easier. Thankfully I have an amazing fiance who is willing to work tirelessly with me until we find a resort that has all of the things we need to make it a fun and safe trip! Or maybe I should pull back the wedding date and marry him quick, before he realizes just how much of a pain my “special issues” are! Has anybody been to a fantastic hotel in Hawaii that you can recommend? Which island do you recommend? Any sites/activities we must do while there? I definitely know how you feel! Moving to a new country has been pretty tough, although my allergies aren’t life threatening like yours. I haven’t had problems in other countries with my food allergies but mine are easier to avoid (peanuts, shellfish, sesame, almost every tree nut). With gluten, I am a bit more nervous. When I went to New Orleans, it was tough also because there is so much shellfish! Hawaii seems like a lovely choice though! I have never been – mostly because of the flight! I DO! Hah. Not kidding. We just honeymooned in Maui and Kauai in July – I got all the info! I’ll email you. Hi! Thanks for your interest in my blog! I’m glad I could come on over and read some of your stuff. I certainly share your concern when traveling…it’s just not easy. I will say that we have been to Disney world and they are really food allergy aware, but maybe not your ideal honeymoon destination. I have a friend honey-mooning in HI right now so I’ll ask her to keep an eye out and send any recommendations your way.